Study of the Bible was an essential part of the lives of monks throughout the middle ages. For this reason the libraries of monasteries contained writings on it that connect it with daily life and religious belief in post-biblical times. Some of the most important of these writings were centuries old, even when this manuscript was written in the 12th century. It has a copy of a commentary on the Book of Daniel by the late 4th to early 5th century author, St Jerome, who also produced the Latin edition of the Bible which became standard in the middle ages and whose writings were known all over the Christian world. A partially erased inscription on the manuscript's flyleaf suggests that it was probably made at the Benedictine abbey of the Virgin Mary and St Rumonus, in Tavistock, Devon, which since its founding in the 10th century had been one of the richest monasteries in the West Country. Books like this usually were decorated only with ornamented letters at the beginnings of sections or chapters because they were made for study not for display in church services, although the decoration could be beautiful and in sophisticated styles. 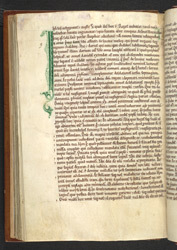 Despite using just a single colour, the artist has produced a remarkably elegant initial 'I'.